So far, 22 league games have been played in the Premier League and no one can complain about the lack of excitement among millions of fans of the most popular football league in the world. Both championship fight as well as the fight for Europe as well as the league promise enormous tension. In the table cellar, the situation for Huddersfield Town is probably already relatively hopeless. For the remaining two relegation places are currently six teams in question – including Southampton FC with the Austrian coach Ralph Hasenhüttl. Southampton meets Everton in front of home crowd this weekend! Southampton is currently in 16th place with 19 points and would be assured of the current state of affairs, but the advantage over the first relegation zone is just one point. 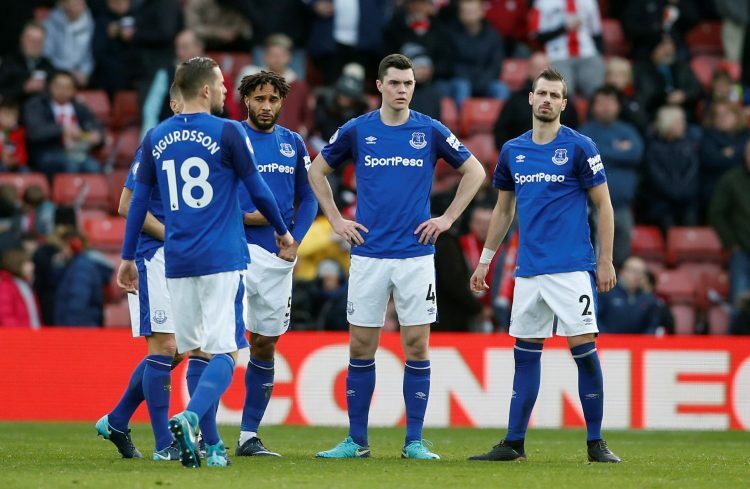 The guests from Merseyside once again started the new season with great ambitions, but tenth place meets the expectations only to a limited extent. In the fight for Europe, Everton must turn off the staggering performance and show more consistency. Quiet odds are offered for the match between Southampton and Everton and it is not easy to forecast on the three-way market. The start of the game at Saint Mary’s Stadium is at 4 pm on Saturday afternoon. That was not to be expected! In the FA Cup replay against Frank Lampard and Derby County Southampton had to cancel the sails. Almost everything spoke for the Hasenhüttl protégés. After all, before the duel with Derby in 19 of 20 cases, the Saints were able to cheer for underclass teams in the FA Cup. Also on Wednesday evening, this victory was within reach. Thanks to a double strike by Stuart Armstrong and Nathan Redmond (68th and 70th), the favorite led in front of home crowd already with 2: 0. However, Southampton gave the lead in the blink of an eye and after 30 goalless minutes in extra time, goalscorer Nathan Redmond was the only player who could not get the ball into the net. In the relegation battle such a defeat hurts twice. For the morale is the retirement after a 2-0 lead catastrophic. It also showed once again that the Saints are a champions this season in playing leads. No less than 15 points left Southampton after a lead in this Premier League season – negative record in the current season. In addition, the 120 minutes mean unnecessary wear of strength, which Hasenhüttl can not afford right now. The staffing is extremely thin. Maya Yoshida is at the Asian Cup, Danny Ings and youngster Michael Obafemi are injured. After all, ex-Bayern players Pierre-Emile Höjbjerg and Yan Valery return after surviving suspension back into the squad. Although Hasenhüttl has a slightly negative score of 2-3-4 in his nine competitive games, he has been able to captivate the fans. He has already composed his own fan song. With Hasenhüttl, the hope of survival has clearly increased. Especially the game forward is much more attractive. In seven of the nine competitive games Southampton has met under the Austrian head coach. However, there was at least one goal in eight games. Hits are virtually guaranteed; Goals from Southampton and Everton are an interesting tip! The qualification for Europe is the big goal of Toffees. In addition, the distance to the top six of the league to be reduced. After 22 matchdays Everton currently has 30 counters on the credit side. The gap to the big six is ​​already huge (Manchester United have 41 points), but ideally, even seventh could be enough to be represented internationally in the coming season. This place is only two points away. However, this seventh place in the strongest league in the world will still be highly competitive. No fewer than seven teams are separated by only six points and can expect to be realistic in seventh place in the table. An enormously exciting spring is therefore imminent. Everton certainly has the quality needed to achieve this goal. But the team of Marco Silva has to act much more consistent. Currently, the benefits are extremely variable. The best example of this was over Christmas, when they had a 2-6 home defeat to Tottenham and only a few hours later Burnley was defeated 5-1. The last games were a constant ups and downs for the Toffees. The upcoming four matches will be pioneering in the battle for seventh place for head coach Marco Silva’s team. With Southampton and Huddersfield Everton has two relegation candidates before the direct competitors from Wolverhampton and Watford. Although the Saints are in a relegation battle, Marco Silva has great respect. Since the takeover of Ralph Hasenhüttl he sees the Saints much stronger than before. Veteran Phil Jagielka (36) injured in training this week and will not be an option. Elsewhere, Everton has a 2-3-5 record so far, scoring 13 goals. Although five of these 13 goals scored in the runaway victory against Burnley, nevertheless, was in six games a hit of the Toffees to see. Only in the goalless draw against Chelsea Everton had to accept no goal. These numbers also suggest that in the game between Southampton and Everton the forecast for at least one goal of both teams is promising. In the games between the Saints from Southampton and the Toffees from Everton in recent years away victories were an absolute rarity. A look at the recent past shows that only one of the last 19 duels in the Premier League ended with a victory for the visiting team. Everton made that exception on Matchday 2 of the 2015/16 season with a clear 3-0 away win at Saint Mary’s Stadium in the Saints. In the last few games, there were not only mostly home wins but also matches of both teams. In both the 2017/18 season and in the first leg of the current season, the fans saw at least one goal of both teams. If both Southampton and Everton meet on Saturday as well, odds of 1.66 will attract this betting opportunity! A completely open affair is for the bookies the play between Southampton and Everton according to current quotas. The highest betting odds for both home and away wins can be found at 2.75 each. A favorite is therefore not visible. The previous analysis confirms this picture, because there are arguments that speak for both the hosts and the guests. For the game between Southampton and Everton, a tip on the three-way market is too risky and acts a bit like random gambling. Despite a negative 3-2-4 balance Hasenhüttl is celebrated at the Saints – the club is still in acute descent need! Only one of the last 19 Premier League games between the Saints and the Toffees ended with an away win! Everton scored at least one goal in six out of the ten previous away fixtures! Nevertheless, there are interesting odds in the game between Southampton and Everton. We like the over 2,5 and the bets on at least one goal of both teams. Everton has a very good offense and scores a lot of goals, but even abroad there are countless goals (only once was played to zero). Southampton also has a much stronger offense under Hasenhüttl and therefore has a very good feeling for at least one goal for both teams. At Southampton vs. Everton, the 6-unit bet on the “hit both teams” tip!